It's worth mulling over that there's very often a connection between the painting I choose and what I've been writing about in the last week. I can't tell you how many incredibly boring battle and war paintings I looked at before deciding to try a different tack! How to participate in "Who painted this? #35"
An avid sportsman, Winslow Homer often combined his hunting and painting excursions, traveling to remote destinations such as the Adirondacks and Canada in the summer and Florida and Bermuda in the winter. This tropical landscape epitomizes his extraordinary range and facility in the watercolor medium. 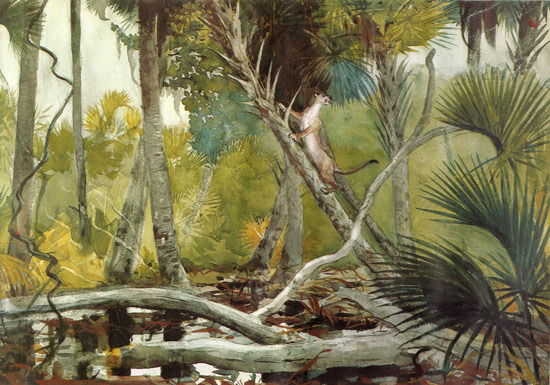 In addition to wet and dry washes, Homer deployed more experimental techniques such as blotting areas of pigment and rubbing the paper (to create texture with dislodged paper fibers), as seen in the whitish fronds in the center of the picture. David Clinch - Spot on with your observation! David J. Teter - my apologies - I was removing duplicate posts and inadvertently removed your correct guess! I'm afraid one of the participants missed the instructions and didn't realise that the name of the artist is not enough! If you'd like to study how people get the correct answer try studying past challenges which are listed in the Page Who painted this? - at the the top of the Page. Since of the requirements is to say how you found it, you can see the various ways people get to the answer. Just for the record - anybody who leaves a comment on the page which lists all the "who painted this?" rather than the specific blog post is not counted. You have been warned! It's been a while since I have gotten one, and I've tried, so no problem on the inadvertent removal. You mention it here and this is all for fun! We do learn a little bit more which each search and that's the real point. How I found it ...I thought it was by one of the artists in the Dulwich Gallery show so after some fruitless searching of them by name I tried the words Bloomsbury group, still life and got the image but no location, a bit more searching and I found the location. It's an oil, bodycolour and collage on cardboard. It's held at the The Courtauld Gallery in London (part of The Samuel Courtauld Trust). I initially searched for still life with banana and then searched for still life with coffee pot and found it. Then I had to find out where it was kept. I went to Courtauld Gallery Site that directed me to artandarchitecture.org.uk. I did not know who did this but recognized it as a Bloomsbury Group. 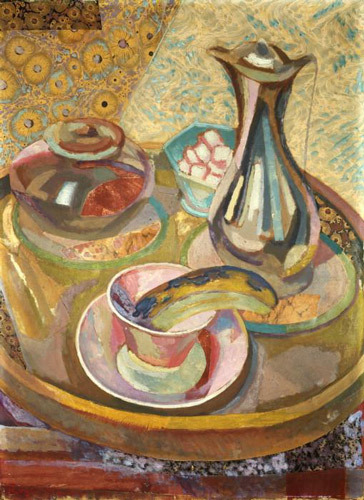 Search Google for Bloomsbury Group Still life and got the answer. Searching "still life on a tray" yielded the artist immediately, but it took a while to finally fill in all the details. Complete info turned up on BBC site. "Still Life with Coffee Pot"
I finally found this painting simply by browsing through all the still life paintings on wikipaintings.Further details I found at BBC Your paintings. Worked from the perspective that. it was either pre or post cubist. Found it on Still life Quick Heart. Sorry if I sent this again. That banana looks past its use by date. Liz Steel is in London and sketching High Tea! 15th July 2013 - Who's made a mark this week? POLL: Which is the best platform for art videos?